Without question, that’s a pretty alarming headline. But, let’s start with the good news. The good news is, a cheeseburger didn’t stab anyone. 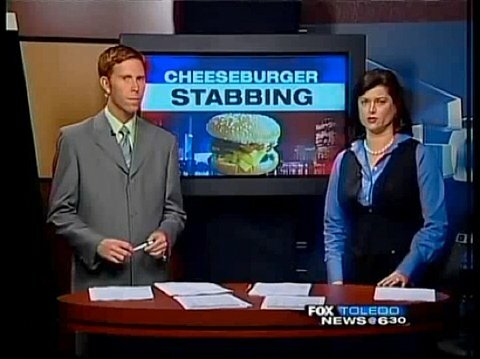 I repeat: no one was stabbed by a cheeseburger. Cheeseburgers are still safe to eat, folks. Chances of being stabbed by a cheeseburger while you go to bite it remain at the incredibly low rate of zero-out-of-one-hundred. Cheeseburgers are not rising up against us, threatening the global order. They have not grown arms, hands, and opposable thumbs with which to yield sharp objects. Humans retain the title of World Heavyweight Champions of the Food Chain. Also sort of good news and a point of clarification: No one stabbed a cheeseburger. That’s right – according to my research, every encounter between a cheeseburger and a human being has ended in a straightforward, although sometimes mindlessly mechanical, sometimes overly ecstatic, consumption. Nothing weird. No senseless cheeseburger violence or cheeseburger hate crimes. Humans and cheeseburgers seem to be getting along fine, as the Good Lord intended. And while there are some reports of men discussing marriage to a cheeseburger, these thoughts all appear to be hyperbolic in nature. Now, what if someone ate one right in front of you while taunting you in regard to your own lack of a cheeseburger? If you and that person could just as easily have been eating cheeseburgers together, or even sharing the same cheeseburger, and yet they put you in your place, your sad cheeseburger-less place – is that not its own outrage? Are you really above confrontation? What lengths would you consider? If you were really, really hungry in that moment, could you even make a rational decision? What line would you, could you, draw? Imagine: your head begins to ache. You hear the growl of your stomach. Your vision tunnels straight to the cheeseburger, everything beyond it a blur. Suddenly, there’s a butcher knife in your hand – how’d that get there? The other person’s chewing grows louder and louder, ringing in your ears, drowning out the voice of reason. The crunch of bacon, of lettuce – it’s deafening. In the heat of the moment, it’s practically instinctual. Territorial. Cheeseburger territory. Could you refrain from gripping tight that knife and cleaving your all-due half? Fighting, maiming if you had to? My God, I hope you never have to be in this poor, young man’s shoes to find the terrifying answers. And what kind of mother doesn’t bring her child a cheeseburger? This family’s doomed.